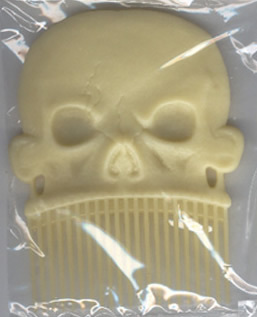 The skull comb is a design both ancient and quaint, imbued with a brutal beauty of ecstatic dread. Each comb contains two stainless steel clips so you can clip it to your belt or car visor. Available in 3 colors. Bone white, black, or glow in the dark. Measures 5 1/4" x 5 7/8".